(SPOT.ph) Jose Antonio Vargas, the Filipino journalist who recently revealed in a New York Times-published essay that he has been an undocumented immigrant in the US for more than half his life, was a guest on Stephen Colbert’s political satire show The Colbert Report last July 14, reports ABS-CBN News. A joking Colbert introduced the Pulitzer prize-winning reporter as "Jose Antonio Vargas who recently admitted to being an illegal immigrant," adding that his "original guest was the American whose job he stole." Vargas, however, clarified that he should be called an "undocumented immigrant" instead of an "illegal alien"-which Colbert insisted on calling him. "I grew up here," he said. "This is my home. I've been here since I was 12. I'm an American. I just don't have the right kind of papers. I don't want a 12-year-old sitting in middle school in America thinking that he or she is illegal." Colbert also asked the openly gay Vargas: "Which was harder, coming out of the closet as a gay man or as a border gay?" to which Vargas replied, "Thankfully we live in a country that does not deport gay people so I am very happy about that. I decided to come out because I am just one of 11 million undocumented people in this country." 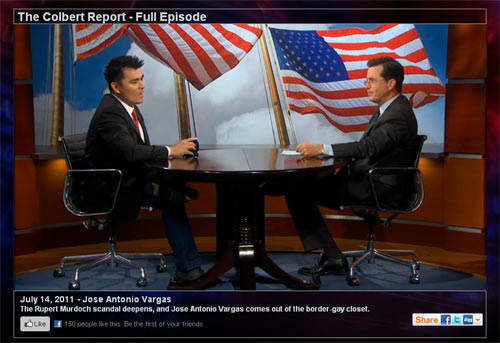 After promoting his website, www.defineamerican.com, Vargas was sworn in by the host as a member of Colbert Nation. "Raise your right hand. Now raise your left hand. Now go turn yourself in to the authorities!" yelled Colbert.